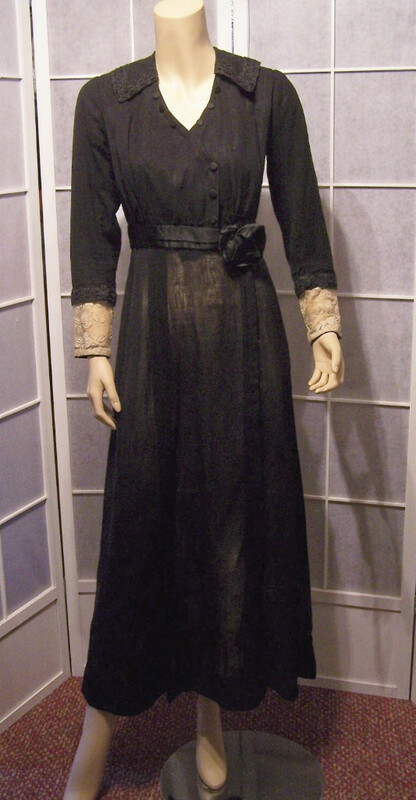 Very elegant, edwardian linen dress gown with pleated satin waist band and bow. V-neck cut with embroidered collar & sleeves. 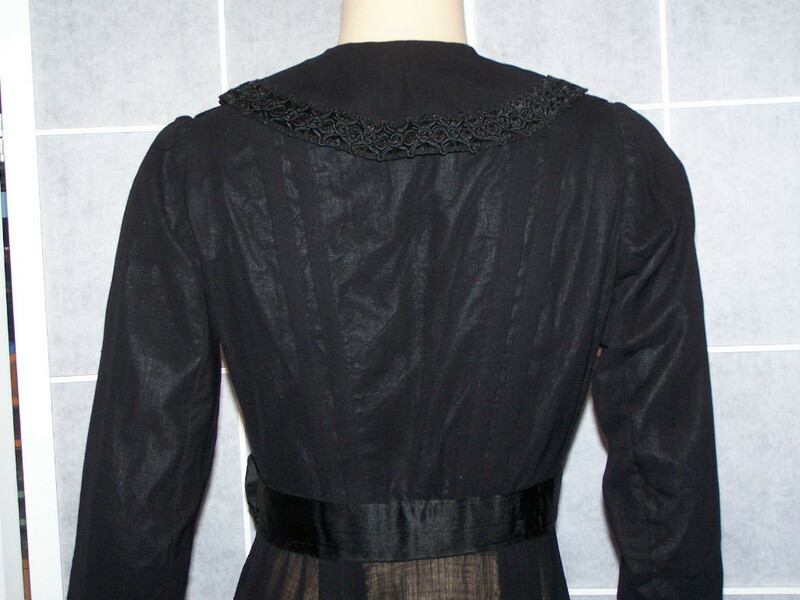 Nine satin covered buttons decorate the top with two hidden snaps to keep top closed. Fully lined. 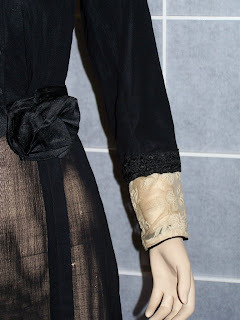 Exquisite 4" ecru lace at wrists. Sheer skirt with front & back 8-1/2" pleat down middle. 3" hem border and heavier inside strip band at hemline for weight. 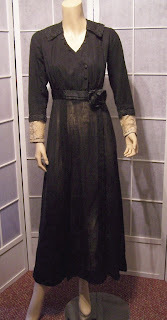 The dress fastens at the left side at waist with nine eye & hook closures running down skirt. Condition: Skirt fastens with eye & hook closures at waist behind flower, the hooks are missing and a baby safety pin is attached to keep closed. A small worn out spot on right side by sleeve cuff, & a small worn out spot left side underarm, both are hardly noticable. There are a few speck pinholes throughout bottom of skirt and one cluster of three spots together. 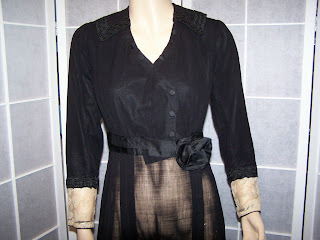 Wear a black slip underneath and you'll never see them. 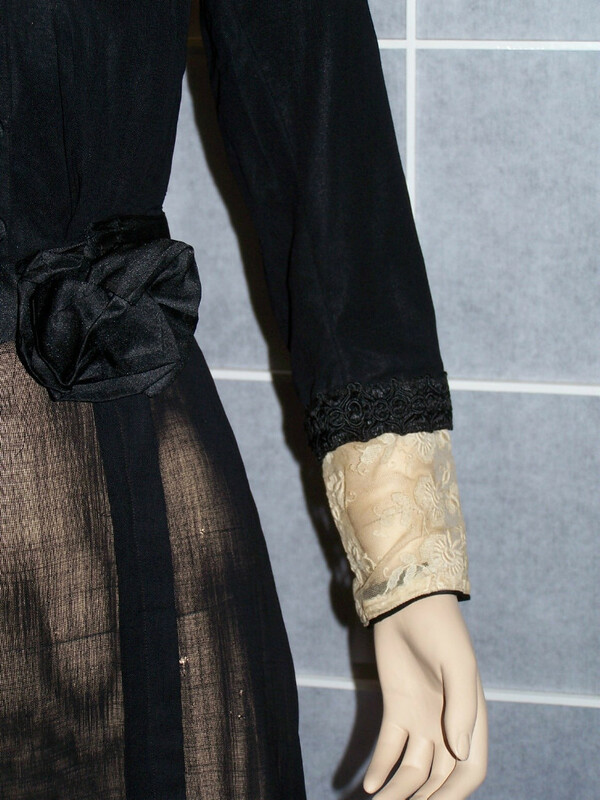 An area of lace on both sleeves have torn away from seam, but luckily, neither of them show on the outside. This is probably from just before or during WWI. A slip would have been worn, of course.